Romney Softens Rhetoric, If Not Policies, In Speech To Latino Leaders : It's All Politics GOP presidential candidate Mitt Romney gets a tepid reception at a gathering of Latino leaders, but says Obama is taking their vote for granted. 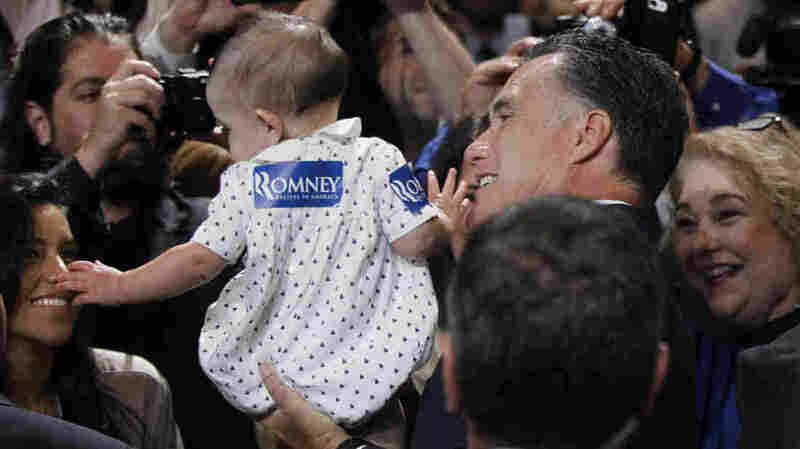 Republican presidential candidate Mitt Romney gives a young supporter a boost at the National Association of Latino Elected and Appointed Officials conference in Orlando, Fla., on Thursday. And he characterized Obama's decision last week to bypass Congress and defer deportation of many young illegal immigrants as an election-year sop to Hispanic voters. The president's action, Romney said, is "a temporary measure that he seems to think will be just enough to get him through the election." "After 3 1/2 years of putting every issue — from loan guarantees for his donors to cash for clunkers — before immigration, now the president has been seized by an overwhelming need to do what he could have done on Day One," Romney said. "I think you deserve better." Before last week's action, Obama had resisted calls to use his executive authority to halt deportations of young illegal immigrants and allow them to apply for legal work permits. He's scheduled to speak Friday at the 29th annual conference — the first sitting president to do so. He'll come in riding a wave of Hispanic support for last week's action, a move that polls suggest has strong support as well from the nation at large. A Bloomberg poll released this week showed that 64 percent of likely voters agreed with the president's policy. On Thursday, Romney did not answer the question of whether he'd let the deportation deferral stand, instead saying he'd pursue his "own, long-term solution." And he did not reverse his promise to veto Dream Act-type legislation that, like Obama's action, would give conditional residency to young illegal residents of good standing. Facing a decidedly cool audience — Obama won 67 percent of the Hispanic vote in 2008 — Romney chose to focus on how the Latino community has been walloped by the recession, including an unemployment rate that at 11 percent is 2.8 percentage points higher than the national average. He urged those gathered to ask the classic election-year question: Are you better off now than you were four years ago? "I believe he's taking your vote for granted," Romney said, noting that Obama failed to fulfill his 2008 promise of comprehensive immigration legislation — even as he enjoyed Democratic majorities in the House and Senate for his first two years. "You do have an alternative," Romney said. "Your vote should be respected." "Is the America of 11 percent Hispanic unemployment the America of our dreams?" Janet Murguia, president and CEO of the National Council of La Raza, the nation's largest Hispanic advocacy group, said Romney's speech felt like a pivot in the right direction. "In many respects, Romney is digging himself out of a hole when it comes to Latino voters, and it felt like he was trying to do that," said Murguia, who is in Orlando for the conference. But she said Romney could have gone further in explaining how he would reform the nation's immigration system and what he envisions for the more than 11 million undocumented immigrants already in the country. "I think he missed an opportunity to talk about the undocumented workers, and about the Dream Act students," she said. "He dipped his toe in the water, but this audience was ready for more." "Most of it was the usual stuff — he wants more high-skilled immigrants, he wants a Green Card to come with an advanced degree, he says that legal immigrants are welcome," he said. "He's talked about all that before." One new element, he said, was Romney's proposal to exempt from immigration caps the spouses and minor children of legal permanent residents. "The main thing for him was to come across as not unacceptable," Krikorian said. "The fact that he pulled it off could be considered a success." La Raza's Murguia said Romney's pledge to seek a bipartisan, long-term solution to immigration issues "felt like an olive branch." And she said his comments on the economy resonate with Latino voters. "The point he made on the economy is part of his strong case for being elected," she said. "But I think he still has a ways to go to capture the hearts and minds of Hispanics." Romney wound up his speech recounting his father's American experience — coming to the U.S. as a 5-year-old after his parents returned from living in Mexico, growing up in a boom-and-bust home and becoming a car company chief and governor of Michigan without a college degree. "This is my father's story," he said. "But it could be the story of almost any American." There are estimated to be 21 million-plus eligible Latino voters in the U.S. In 2008, 9.7 million Latinos voted; some projections put their potential turnout this year at more than 12 million. Increasingly, the story of America will be their story, something Romney acknowledged just by being in Orlando on Thursday, and in his comments. "Your voice," he said, "is more important now than ever before."